Famous Mark Verheidens Of Filmland: Burger Continental R.I.P. I had occasion to pass through my old stomping grounds of Pasadena, CA. 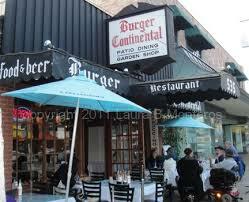 recently and drove past the location of an old fave restaurant, Burger Continental. The elegant signage was still there, but the ominous "Farewell" poster over the door (which I only caught on the fly, driving past) suggested the B.C. was no more. When I first moved to Los Angeles, I took up residence in an area called Highland Park (basically between downtown L.A. and Pasadena), where I lived in rather seedy apartment complex called "The Golden Palms." The G.P. (we used initials for everything back then!) had become a low-price hangout for students attending the nearby Art Center for Design. I came in toward the end of that era, and while I was not a student at Art Center, my reasons to be there were similar to the starving students, i.e., I had no money and the place was cheap. Actually, it was even cheaper than it should have been. The building was under rent control, which meant rents could only be raised a set amount on current tenants. If a tenant moved out, the new tenant could be charged whatever the landlord liked. But somehow the residents remained remarkably stable during my time at the G.P., as in, my apartment was actually listed under another name. You would think that would raise an eyebrow from the owner, but turns out he was an absentee landlord named "Mr. Tung" (I'm not kidding) who didn't seem to care who handed him cash every month, as long as he got it. Mr. Tung used to walk the corridors of the building with a bag that literally had a dollar sign on it, like the Monopoly guy, collecting rents. Given this was a fairly gang ridden area, I was always surprised at his bravery, but as long as he didn't raise questions, que sara sara. Anyway, groups of us would occasionally pile into a car and head over to the B.C. for Greek food (I know, "burger" continental, but what can I tell you) and beers. It was a friendly, open air place as I recall, and we spent many an evening arguing over art and love and God only knows what else after downing ten beers with our falafal. But my fondest (sort of) memory of the B.C. came when I suffered a romantic set-back in my life and was really, really, REALLY down. My neighbors, who hadn't known me that long, nevertheless could see I was a mess. Maybe it was when they saw me staggering teary-eyed toward my apartment with a 12 pack of beer and a bottle of Jack Daniels. Anyway, out of the kindness of their hearts, they dragged me out to the B.C. so I wouldn't be alone. Those neighbors, as I recall (and things were a little foggy that night!) were James Gurney (yes, THAT James Gurney, the guy who later created Dinotopia) and Thomas Kinkade (yes, THAT Thomas Kinkade, later known as the "painter of light"). Good times -- at least in my memory.